With the upcoming changes to the United States Bowling Congress awards program the VPUSBC Awards Committee would like your input regarding the type of awards we offer to our bowlers. Currently the VPUSBC offers several local awards. Please take the poll below and give us your opinion and leave comments if you like. This entry was posted in VPUSBC on April 20, 2013 by Virginia Peninsula USBC. 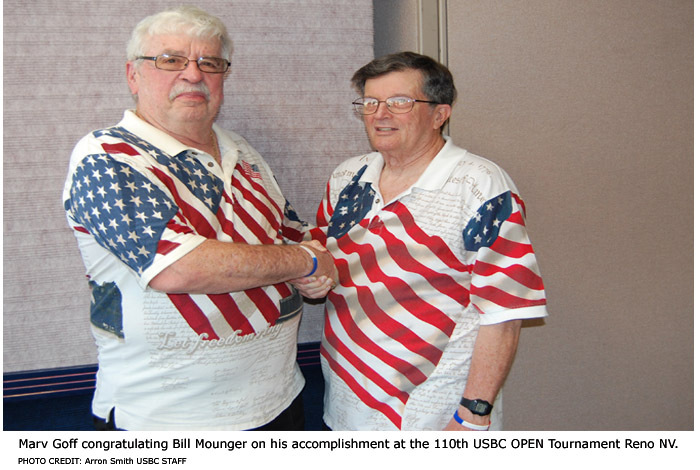 Virginia Peninsula USBC bowler Mr Bill Mounger has reached a milestone in bowling! This year will be his 30th trip to the United States Bowling Congress Open Championship tournament in Reno Nevada. 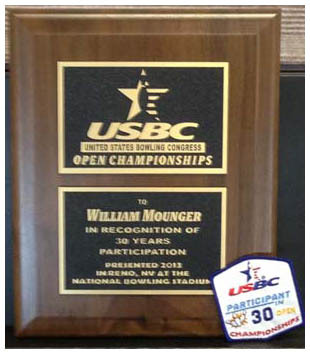 Bill was recognized by the USBC during the Meeting before his 3:00 PM squad on Wednesday, April 17th and presented a plaque to honor him, his dedication to the sport of bowling. 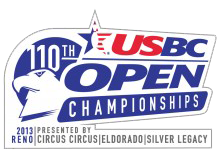 Since 1984 Bill has participated in every USBC Open tournament held staring in Reno, NV. the list of cities and states are impressive. We’ll have more on Bill’s 30 year adventure when he return from Reno, please come back for his story. We could also like to thank Matt Cannizzaro and Aaron Smith and the Staff at the USBC OPEN Tournament, for taking the photos and forwarding them to VPUSBC. This entry was posted in VPUSBC NEWS on April 18, 2013 by Virginia Peninsula USBC. Donavan Larsen, Scott Butz and Marcus Silas of Grafton High School came in 1st place, interesting, the three boys are also two handed players adapting to the new style with great success. A Two-Handed Approach is a bowling technique whereupon the throwing hand is in the bowling ball and the opposite hand is also placed on the ball during the shot, notable professional bowlers with the two-handed approach style include Australian Jason Belmonte, Finn Osku Palerma. 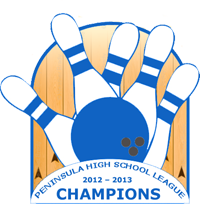 This is the second year in a row that Grafton High School has placed 1st in the Peninsula High School League and with these young bowlers returning next year it appears that a Dynasty may be in the making. The second place team from York High School, Tyler Moore, Jeff Harberts and Kenneth Johnson were also the 2012 – 2013 Hampton Roads District HS School League District and Clyde Robert Perkins Virginia State HS Champions this year. One notable accomplishment was Emily Deeds from Poquoson High School bowling a triplicate the first week of League. This entry was posted in VPUSBC, VPUSBC NEWS on April 17, 2013 by Virginia Peninsula USBC. 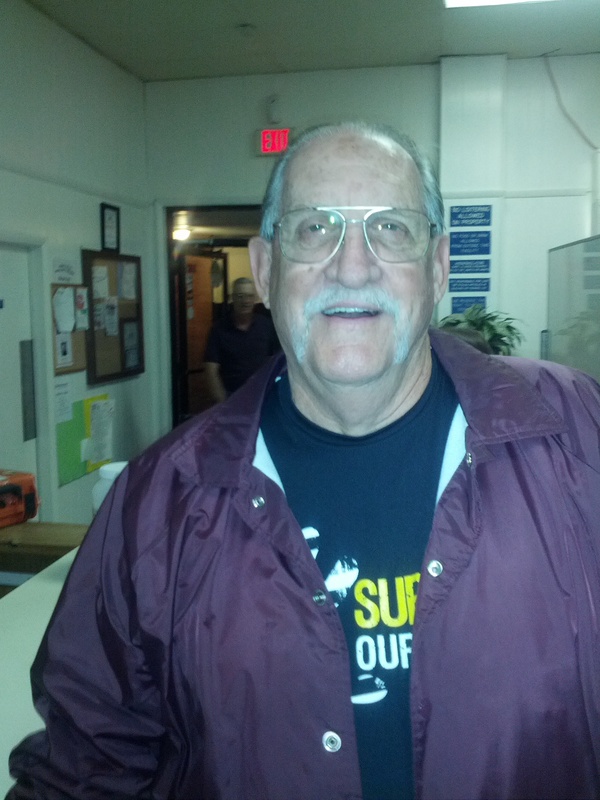 At the age of 69 Ken Stearn of Gloucester , Virginia rolled back to back 300’s on the Thursday Night Mixed league at Village Lanes on April 11th, 2013 finishing the night with a career-high 782 series. “He’s definitely the oldest in the local association ( to accomplish this feat). Neither State nor Nationals maintains those types of records. I have not heard of anyone in the state accomplishing this feat.”. “It was just one of those nights. I was in a zone and everything felt right,” Stearn said . It even felt right in his third and final game, a 182. “All the balls were in the pocket, but they weren’t carrying,” he said. Ken Stearn has been bowling for 45 years starting his bowling career in 1973 at Dover Air Force Base while serving in the US Air Force. After several assignments which moved him from Delaware to Texas to Germany he retired and settled in Gloucester , Virginia . Ken has two 11-In-A-Row plaques and has rolled five 300 games, two of which occurred on the same night. Ken also serves as the President of the Thursday Night Mixed League and Vice President of the Tuesday Mini-Bucks League at Village Lanes. He also serves as commander of the Veterans of Foreign Wars Chapter in Gloucester . This entry was posted in VPUSBC NEWS on April 15, 2013 by Virginia Peninsula USBC. The annual Virginia Peninsula USBC Awards Dinner, Bowlers Night Out, was held on April 6th 2013 at Crowne Plaza Hampton-Marina in Downtown Hampton. Cocktails and Social hour started at 6:00 P.M. and dinner was served at 7:00 P.M. followed by the Award Presentation. Opening remarks were made by Mr. Howard Marchant followed by Virginia Peninsula USBC President Mr. Bill Binks who introduced the current members of the VPUSBC Board of Directors. The Awards program started off with Association Manager Mrs Betty Watlet presenting the first Al Watlet Meritorious Service Award, named in honor of Mr Al Watlet who had served as Association Manger to the VPUSBC and the Hampton Roads Bowling Association until his pasting in 2012 the recipient was Mr. Gary Woods. February is traditionally Bowl for the Cure month and centers and leagues were asked to hold fund raisers including 50/50s, raffles. This season a “Bo wl for the Cure” league was started at AMF York Lanes. More than $2700 was donated from the Bowl for the Cure League!! Bowl For the Cure Committee member Charlene Osborne reported a grand total of $4953.07 sent to the Susan G. Komen Bowl for the Cure Fund from the Virginia Peninsula USBC. Each year Mr Bill Binks as Virginia Peninsula USBC President has the honor to select the VPUSBC Director of the Year and announced this years recipient Mrs Betty Watlet. Youth Directors Mary and Robert Pancoast presented the Scholarship awards. The Virginia Peninsula USBC first recipient was David Barhite from the Sparetimes Youth League, received $1000 for the first year and it is renewable for $500 for the following three years. The second recipient, Courtney Stanford from the High School League at AMF York, received $750 and it is renewable for $500 for the following three years. The Virginia Peninsula USBC Coach of the Year was presented by 3rd Vice President Mrs. Laura Favata was awarded to Gary Powell who coaches at Sparetimes in Hampton. The Association USBC Award of Merit is presented to the person(s) who have the highest 2011 / 2012 Association highest Average / Series. Nominations for next years class for the Virginia Peninsula USBC Hall of Fame are now being accepted. The Members of the Virginia Peninsula USBC, the Officers and Directors congratulates our fellow bowlers on their performance over the year, to those inducted into the Hall of Fame we thank you for your support of the Sport of Bowling. There were photos taken during the event and we hope to have them soon online. This entry was posted in VPUSBC NEWS on April 14, 2013 by Virginia Peninsula USBC. The annual Virginia Peninsula USBC Open membership meeting took place at Tabb Library, Saturday April 13th 2012. Attendance suffered due to the warming weather and we encourage all members of the VPUSBC to plan to attend next year, to build a strong association for the next generation of bowler will take the collective work of all of us. The meeting was called to order by Mr Bil Binks, President of the Virginia Peninsula USBC and Association Manager Mrs.Betty Watlet took a rol call of the Board of Director present followed by Mr. Bill Binks presenting the minutes for the last meeting which were accepted by the membership present. Bill remrked that the Awards program, which was established in 2011, has been well received by the Membership and praised the Ways and Means Committee with the work they have done from VPUSBC logo apparel, vehicle stickers and other assorted items offered for sale at our events. The VPUSBC conducts two major function a year, in 2012 Bowlers Appreciation Day, know as BAD, was deferred this year and the Board is looking to reformat the event and look for your suggestion on how to improve the experience. Bowlers Night Out which was held April 6th, 2013 at Crowne Plaza Hampton-Marina in Downtown Hampton with over 200 members attending and deemed a great success by all attending. The Bowlers Night Out will move to a new date next bowling season being held sometime in the October or November time frame, thus allowing to move the Bowlers Appreciation Day to a Spring date. This adjustment of the Bowlers Night Out and Bowlers Appreciation Day would move the Hall of Fame Dinner to a late August to September time. The USBC Membership stood at 4336 paid members in the VPUSBC, down by approximately 3% from last year as of April 1.2013. The Association Manager reported the Association is in excellent Financial shape. 1st Vice President Jim Brooks reported on the Audit/Finance and Lane Inspection Committees, 2rd Vice President Robert Slaughter reported on the Ways and Means, ByLaws and Awards committee’s and 3rd Vice President Laura Favata reported on the Scholarship, Yearbook and Publicity Committees. Bowl for the Cure had a total donations of $4953.07 and this season a new league was started at AMF York, Bowl for the Cure League, raised more than $2700.00. Special Committee reports were given by, Mr Kevin Morris (Hall of Fame), Mrs Betty Watlet (Tournaments and Bowler of the Year), Wayne Ripley (Al Watlet Meritorious Service Award), Bob Pancoast (Youth Committee and Coach of the Year) amd Bill Binks ( State Tournament). Awards Committee chairman Wayne Ripley report attracted the most interest. The United States Bowling Congress announced in early March a major overhaul to the awards program that will take effective 2014 – 2015 bowling season. Only Honor Score awards 800, 300 and 11 in a row awards will be issued. This leaves local Associations in the position to either fund their own awards program or simply not offer awards to replace the USBC Special Achievement Awards, the bag tags and lapel pins for average-based game and series awards, association championship tournament awards, and end-of season league awards. Mr Robert Pancoast also brought to the memberships attention that starting i the 2013 -2014 season the USBC will also replace patches with printable certificates which he showed an example. The focus of the meeting then moved to New Business, Election of new Officers and Directors. After the elections there was a period of time allotted for questions from the foor, and several discussions about the USBC dropping awards, the upcoming USBC Convention and what direction the VPUSBC awards program may go. The Meeting was then adjourn by President Mr. Bill Binks. This entry was posted in VPUSBC NEWS on April 13, 2013 by Virginia Peninsula USBC. Christopher Spells and Charles McAdams of Newport News topped the list of major winners in the Virginia Peninsula USBC Open Championships that wrapped up two weekends of bowling March 24 at Sparetimes in Hampton. Spells won the scratch singles title by one pin over Dustin Weymouth-German with a 756 series and finished second in the scratch all-events with a total pinfall of 2,130. McAdams captured the all-events with a score of 2,146 and teamed with Dewayne Willis of Newport News for the doubles crown (1,449). The scratch team championship went to Gregory Boyters, Ricky Boyters, John Confalone III and Michael Smith with a 2,827 total. In the handicap division, Jody Edwards had an impressive tournament, winning the singles with an 851 showing. He also rolled his first 300 game and placed third in all-events (2,325). Shirley Ferguson, Donnie Ferguson, Katharina Clark and Christopher Clark took the handicap team title with a 3,069 total. Other handicap winners were Anthony Darr of Gloucester in all-events (2,444) and Wayne Nitzschner and John Banicky in doubles (1,550). Like Edwards, Ricky Boyters bowled a perfect 300 game during the tournament. This entry was posted in Tournaments on April 3, 2013 by Virginia Peninsula USBC.